I forced the two ends of the break out where I could get at , then heated each end separately with a pair of red hot tongs and turned a hook or lap on them the same as the joints in knock-down stovepipes. When the ends were hooked together, the spring worked as good as new. The heated portion did not affect the strength of the spring. --Contributed by Marion P. Wheeler, Greenleaf, Oregon. When playing loud and harsh records on a phonograph the music is often spoiled by the vibration of the metal horn. This may be remedied by buckling a valise or shawl strap around the horn, near the center. Anyone possessing a phonograph can try a very interesting and amusing experiment without going to any expense. Remove the belt and replace with a longer one, which can be made of narrow braid or a number of strands of yarn. The new belt should be long enough to allow crossing it, thus reversing the machine. This reverses every sound on the record and changes it to such an extent that very few words can be recognized. Very sharp thorns can be used successfully as phonograph needles. These substitutes will reproduce sound very clearly and with beautiful tone. The harsh scratching of the ordinary needle is reduced to a minimum, and the thorn is not injurious to the record. The core, Fig. 1, consists of six strips of wood beveled so as to form six equal sides. The strips are 3 ft.
long and 3 in. wide on the outside bevel and are nailed to three· blocks made hexagon, as shown in Fig. 2, from 7/8-in. material. One block is placed at each end and one in the middle. A 1/2-in. metal pin is driven in a hole bored in the center of each end block. 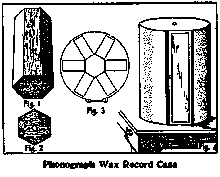 The bottoms of the pasteboard cases, used to hold the wax records, are either tacked or glued to this hexagon core, as shown in Fig. 3, with their open ends outward. Two circular pieces are made of such a diameter as will cover the width of the core and the cases attached, and extend about 1/2 in. each side. A 1/2-in. hole is bored in the center of these pieces to receive the pins placed in the ends of the core, Fig. 1. These will form the ends of the cabinet, and when placed, one on each end of the core, heavy building paper or sheet metal is tacked around for a covering, as shown in Fig. 4. A small glass door is made, a little wider than one row of cases, and fitted in one side of the covering. The outside may be painted or decorated in any way to suit the builder.